Simple and quick, good value! 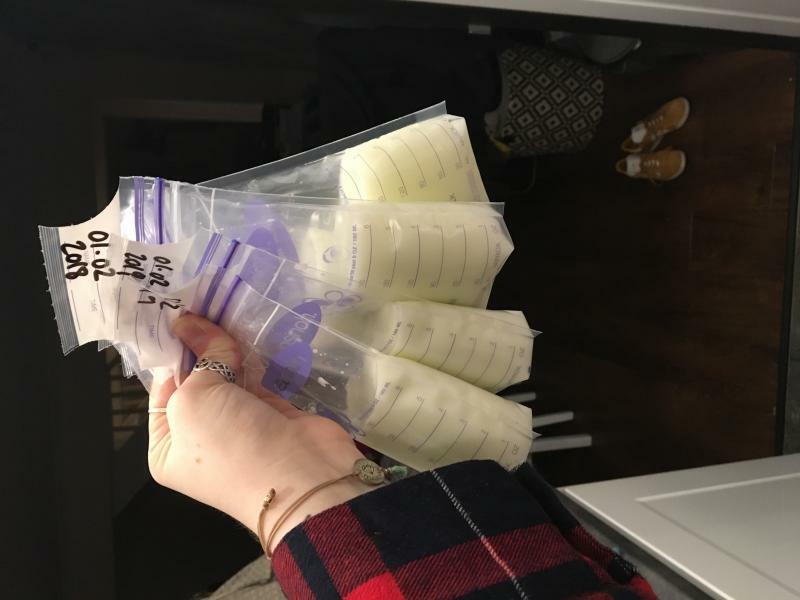 I had a huge over supply when I was express feeding my little one, so ordered some of these breast milk storage bags to keep my milk for when she is weaning. The bags have been designed really well, with labels for the important information to write on them regarding date/time/amount (necessary if wanting to donate milk). I just wish they came in larger sizes as I was sometimes using up to 4 a day! I love these storage bags. I have tried a few as I thought these were pretty expensive but they were the best. They have a double seal on them so never had one leak. They have a tab where you can put information on them such as date, time and volume. These were good bags but you have to make sure they don’t tip over. I had a few that would leak out of the side. And they aren’t very thick quality. Over all they are good and do the job unless they tip over and leak. 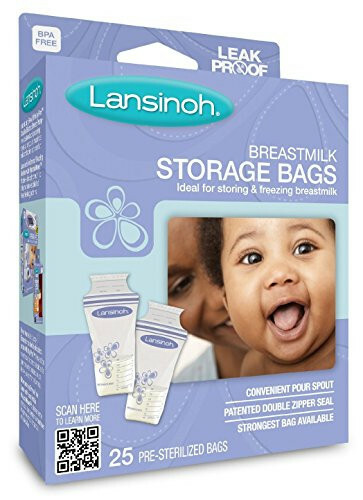 I received a number of free samples of these breastmilk storage bags and quite honestly they work no differently to other breastmilk storage bags but these do have a double seal to stop them leaking. They are a little bit more pricey compared to other brands who store double the amount of milk. However these bags are great for a baby who drinks 180ml (6 ounce) or less per session. They are great for popping in freezer however, if frost flatly can be stacked so take up less space in freezer. I didn't have any problems with these bags leaking or ripping. However I wouldn't choose to purchase these as they don't storage a lot of milk. These are great quality and value for money. They are easy to use and compactly store milk in our freezer. Highly recommend! I love these bags as they and thin and don't take up much room in the fridge or freezer. They are brilliantly made and can be used directly with both my lansinoh electric breast pump and my mam manual breast pump instead of using a bottle to collect from the pump. I have a lansinoh electric breast pump that these bags are supposed to fit straight on to, however I struggled to attach and when I eventually thought I had it right it didn’t feel secure ! So took straight off! I used normally just as a bag to store milk after rather than pump into, then I cannot fault them ! Easy of use and, double lock and space to write on. Wary of standing on their own in case they tip and I lose milk. These are clear, clean and easy to use. They have a good separate label area to date and write measurement on. The double zip lock seal makes them feel extra secure so I worry less about spillage when stored. My only main issue with these is that you have to make sure you fully open the bottom of the back that makes it stand it else you get false measurements from the bag. Otherwise good though. I will be using these again. I thoroughly love these milk storage pouches. They are easy to use, have extremely accurate measurements and take up little to no space in my fridge and freezer compared to plastic pot versions. My only con is I am constantly worrying about the fastening of these and that it may fail or not be completely secure and spill the milk. A zip lock might be better? However saying that I have used these for 6 months now and it never has actually failed just something you have to be extra careful with! My baby is 2 months old now and I'm still breast feeding. While milk is coming a lot I was excited every day put something little extra in freezer for future. So, yesterday, I took one bag out from freezer, defrosted, little warm-up milk and tried -- it STINKS like PLASTIC and `new taste` is not sweet like my milk. It's BITTER and DISGUSTING.. I'm so sad that I need to THROW OUT all my bags (more than a litre). I CAN'T give this to my little one. I have used this to store all my expressed milk and so far so good! I’ve had no spills which is so important for me once I’ve sat and pumped I would be heartbroken if it spilt! Sterile pouches ensure you’re storing your milk hygienically and can store for up to 6 months in the freezer, perfect for creating a stash to use to add to porridge for weaning and for use when I’m at work. Strong sturdy bags. I've not had any split and they are easy to poor out of. Great size as the generally take 1 feed so means you don't have to defrost more than one, or split that bag into two feeds. I’ve used these to store my Breastmilk for the past month. There already sterilised and easy to stack so can’t complain! I also think the option to write the date, time, amount and name on them will come in handy when little one goes to childcare so great feature. There also the cheapest ones that I have found! I find these very expensive in comparison to some other brands. They get the job done, but I always thaw in a sterilised tupperware dish in the fridge to avoid wasting any of my hard earned milk. Need to open bottom properly or you get false measurements. These bags are great. Do exactly what they are supposed to. They have a double zip seal to avoid any spillages because I have often cried over spilt breast milk...it’s like liquid gold hehe. They are pre sterilised with a tear off section. Great to get a supply going in the freezer. Got this as recommended by my friend. Love that it's double zipped to prevent leakage and ensure content is not contaminated. However the top zipper can sometimes spoil so it actually creates a hole and can't be used. I have a couple of it bring this case. Plastic is not the filmsy kind which is excellent as no mum would like their milk to be contaminated. These storage bags are great value for money for the quantity you get. The peel off top is great to ensure sterility but once off it statically sticks to you so is difficult to dispose safely. I've never had any problems using these bags to store my milk. They're quite floppy but have never leaked. Recommended. Really handy for popping in your bag if you need to express away from home. Pre sterilised and easy to label. Handy if laid flat when storing too especially in the freezer. Have had a problem with a few bags flopping over before I’ve properly closed them which resulted in spilling the milk but once you realise that it’s easily avoided. The breastmilk storage bags are a lovely design, they store milk well the only complaint I have is that it's hard to keep them sterile especially when storing milk for newborns. 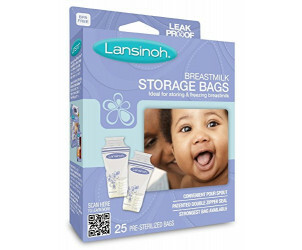 Worry-free storage of your breastmilk with the Lansinoh Pre-Sterilized Breastmilk Storage Bags. No more crying over spilt milk, these bags are designed to combat all of your biggest fears: leaks, spills, and fragile plastic - are no more. 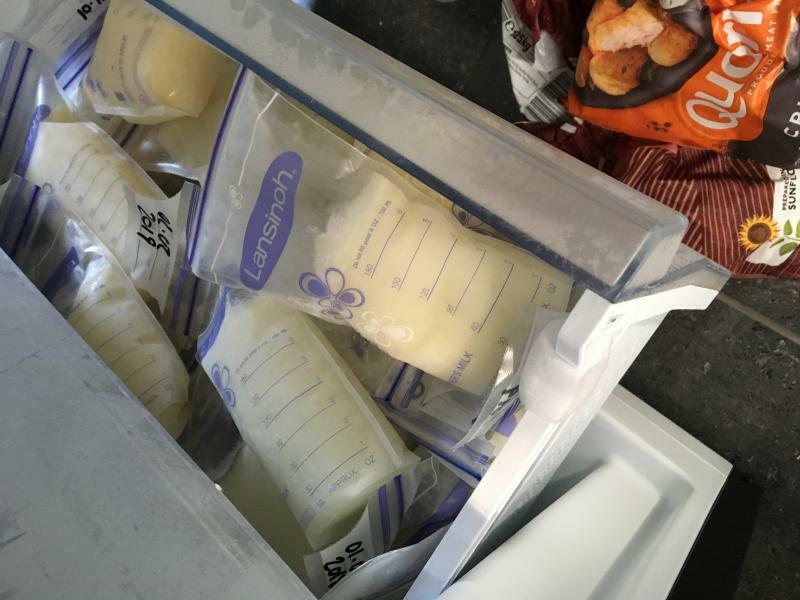 With a secure patented double seal, pour spout, and strong construction, you can conveniently store and freeze your breastmilk with confidence.